In this category we gathered valves from PMV series. This is universal solution for manual operated valves because you have to choose valve body separately and then your required manual control. 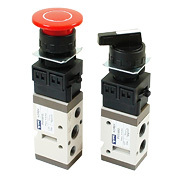 Below you will find valves as well as separate operators which you have to add to cart separately. For your convenience available operators are also visible on product page. Flow speed from 200 l/min to 1000 l/min (tested at 5 bar) depending on valve size. Temperature range: -10 to 60°C (ambient and fluid). Button Parts: Stainless Steel, POM. Switch Parts: Glass Filled Nylon, POM.